Our 400th Challenge at JUGS! 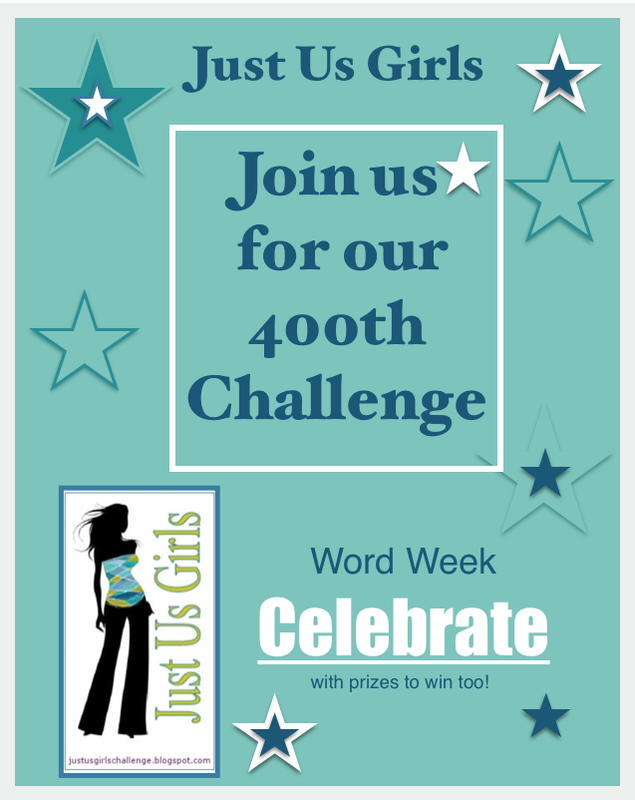 Hello Friends, Over at Just Us Girls we are CELEBRATING our 400th CHALLENGE! Is that an accomplishment or what! I wasn’t fortunate enough to be on the Design Team from the beginning, but I sure was playing along with them way back when! In fact, JUGS played an intricate part to this card making journey I am on, and for that I am so very grateful! I also want to take a minute to welcome Aileen Ryan our new Guest this month. We are very glad to have you with us! What a great week to be joining us! In other NEWS…Chris one of our DT members is stepping down from the team and we want to say good bye and good luck! I will miss you Chris and wish you all the best in where ever your life takes you! Don’t be a stranger! With that being said, we are excited to have Angie Cimbalo joining our team! Angie has been been a participant in our challenges, and a previous Guest Designer, and we are thrilled to have her joining the JUGS Team! Please stop by her blog and say congrats to her! Card details: Paper I have been wanting to use forever, but I have no idea whose it is! The flowers are from MFT. I think the sentiment is from Verve but now I am not sure, as I made this card a while ago! Please come on over to JUGS and join in on our CELEBRATION…I hear there are prizes too! The Chic of this Week will win a $15 gift certificate AND, 1 random winner has their choice of a 4×6 stamp set, or 2 [in-stock] 3×5 stamp sets. A huge thank you to these generous companies!!! Categories: Cards | Tags: Card making, Cards, Happy Birthday, rubber stamps, stamping | Permalink. That sure is a gorgeous card. So pretty and such a country feel to it – love those flowers and the sweet hearts in the centers too! Gorgeous! Very pretty. Love the kraft flowers and pretty pink papers. 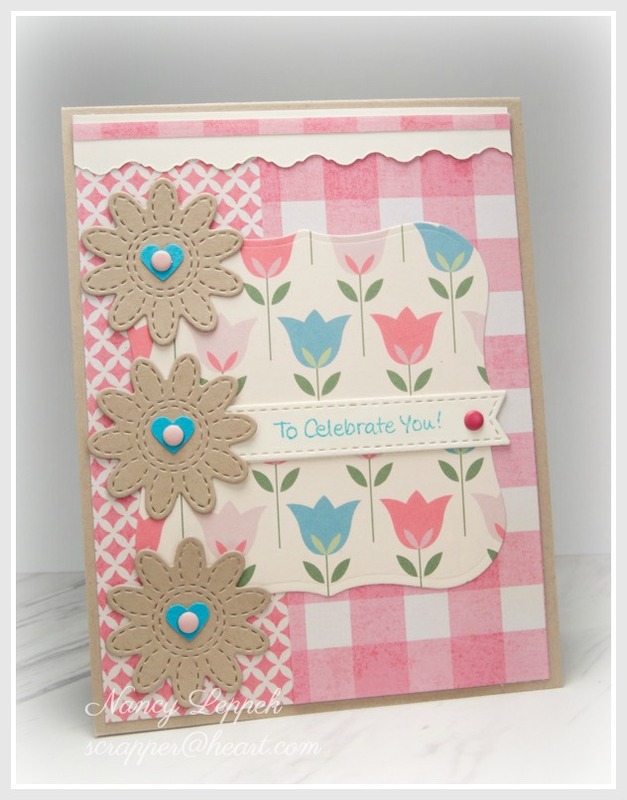 Love the soft colours and awesome layout Nancy. Such a sweet card. Congratulations on your 400th challenge. That is quite a record. Loving your checked, pink and flowered card. It has a summer picnic look to it. Angie will be a great addition to your group. Best wishes for 400 more. Wonderful Card Nancy, love the papers used, so pretty. Great celebration card! That paper is perfect on this beauty. Love those flowers. What a sweet card. I love the pop of kraft with the pink and blue. Those flowers are so cute with the little heart centers. I LOVE this. Your card reminds me of a homey country kitchen, Nancy.